cliff, sorry to keep beating the dead horse but i'm actually hoping you will tell me why mobilehid is better than hidextra. i want quality and i'm trying to figure out wat more quality i can expect out of mobilehid than hidextra to see if it justify the price difference. also, the reason i'm askin about quality difference is because i plan on getting a 3000k fog kit, pair of 6000k bulbs (since i already have LS430 retrofit for more output) and another 5000k low beam kit for a bmw 3 series. i rather order once and do it right... plz get back to me. thx! Last edited by Legends6spd; 08-13-09 at 09:45 AM. I hear ya on wanting to understand the differences man. As with all products, there will be differences with the materials used to make them. The thickness or types of the materials used will have an impact on the performance, durability, longevity, etc... I've tested many different kits on the market and you wouldn't believe what kind of corners will be cut to save money at the end user's expense. ( http://m.youtube.com/watch?v=KFlZZuk...ient=mv-google ) where a ballast is subjected to the most ridiculous stress test imagineable. In the video a ballast that was used for approximately 10,000 miles was taken out of service to undergo a beating with a hammer. The ballast was turned on and powering a light at the time and what's not mentioned in the video but should be noted is the fact that the video was the 3RD TAKE! The ballast already had sustained cosmetic damage from earlier beatings and you can see the dents in the case before the hammering starts. It's this kind of quality construction that is used to produce a product that will continue to run long after other ballasts have failed when subjected to the same tests. Customers in the past have shared some crazy stories about these ballasts continuing to work under the most unlikely situations. A past customer installed a set into his car and simply secured the ballasts with a couple of zipties on the shock towers of his car. He drove for a few weeks and reported that his lights were flickering every now and then but his old set from some other company did too so he didn't give it much thought and didn't report the issue. Turns out, when the ballast failed and he opened his hood, his ballast had slipped over to the engine and had been rubbing against a pulley which created a half inch deep gouge into the edge of the ballast. It still functioned while rubbing against the pulley even under intense heat caused by the friction and even after the exterior case was compromised. Another story, this one from one of our members here, happened in Texas where a GS owner had a ballast fall out of his engine bay while driving. It was seen dragging on the pavement by other CL members while they were all driving. The ballast finally unclipped from the wires and got run over by the rear tires and subsequently other cars behind him before he had a chance to turn around to get it. Once he did, he connected it back into his car and it still worked. So materials wise, the ballast is designed tonbe very stout. 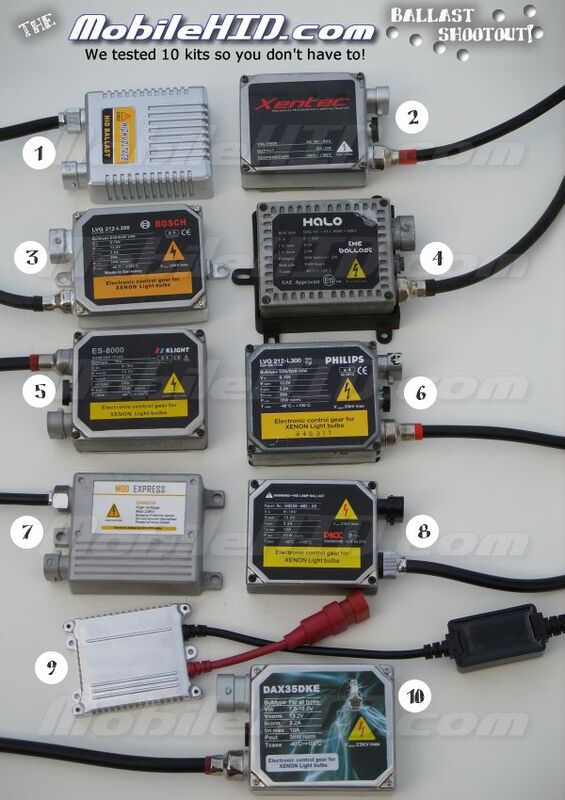 With regards to the kit as a whole, many other kits do not come with a relay harness and if you are going to get a kit, I suggest you look for one that comes with one to prevent the need for all your OEM electrical equipment that is being fed power to compete with your ballasts. Hope that helps explain the advantages of the kit. I can probably dig up some, how many do you need bud? awesome explaination . i appreciate you taking the time out to do that. i use to have a HID kit for my SC300 back in 02 (bought it for $600) and it had a philips ballast which was quite sturdy so i definitely know what you mean by the weight and quality. that said, if it does fail, do you guys have any warranty by any chance? Yep, there's a one-year warranty. For the most part, if anything defective were to affect the life of the kit, it will occur within the first year. The replacement process is easy, just ship the busted part in with a copy of your purchase confirmation e-mail so we know where to return the replacement and we'll send out a replacement - that's it. Regarding your want to purchase one kit from each vendor... lol - beat ya to it man! final question. since i have the LS430 retrofit (but still has oem 4300k), if i want to upgrade the color for it, do i just buy the 9006 6000k bulb or do i buy the D2S 6000k bulb that you have listed for $60? I'm not sure what the difference in the two are. also, would it be a disservice to the projector/retrofit if i had lessen the output but going w/ a more blue temperature? You have to buy a D2S bulb because a 9006 won't fit into the projector. As far as color temperature I would not recommend anything above 6000K. It's when your ballast fires up without the bright flash. Some ballasts do it, some do not. I've found that the ones that do, tend to warm up the bulbs a bit faster. Also, yep - DarkKnight is right - You're going to need a D2S bulb for those projector housings. I saw a video of a mobileHID startup on a 2010 Prius. It had a teal flash before startup. So does that mean mobileHID ballasts do not soft startup? Yeah, those TL tails are pretty cool. What color do you want? I have some extra tail lights here that I can test some bulbs with. If you want to do this project, you'll likely have to hot glue an H3 bulb into the tail and route the wires through the metal to the trunk where your ballast will sit. I'm pretty sure the TL customer had an aftermarket stereo system where he was able to connect the ballasts to power without interfering with the OEM circuitry. correct, they do not soft start. i've only seen one ballast that offers the soft start and that is the philips ballast. Ahh ok I understand now. Thanks!